Texas is among 47 states that allow students to claim vaccine exemptions based on religious beliefs. More than 1.5 percent of kindergarten students in Texas were not vaccinated because of religious or personal beliefs in the 2017-2018 school year, recent data released by the Texas Department of State Health Services (DSHS) shows. The percentage of kindergartners claiming non-medical exemptions grew by 157 percent since 2010, according to the data. Texas is among 47 states that allow students to claim exemptions based on religious beliefs. Currently, 18 states including Texas also allow exemptions based on personal or philosophical beliefs. Reports released by the DSHS show that non-medical exemptions among kindergarten students increased by 136 percent for the polio vaccine, 169 percent for chicken pox (varicella), and 153 percent for tetanus (DTaP) since 2010. 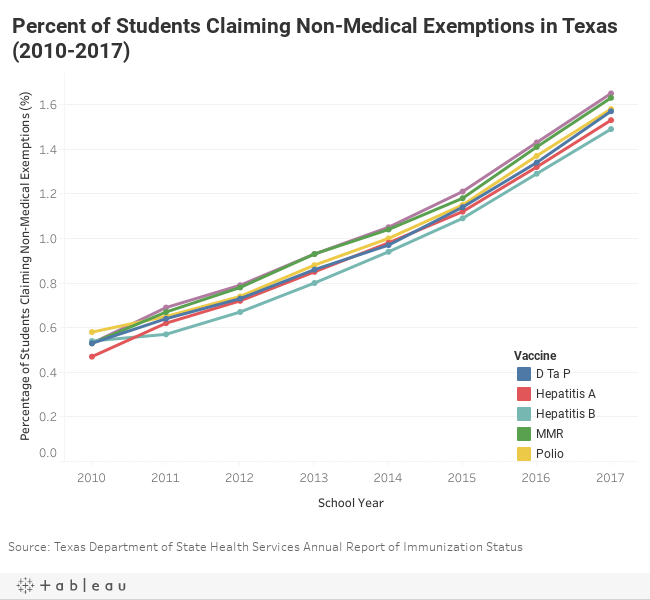 The DSHS data shows how many non-medical exemptions are claimed in each county in Texas and provides the percentage of students that are covered by standard vaccines including those protecting students from polio, Hepatitis A, Hepatitis B, tetanus, measles, and chicken pox. Hover over each school in the map below to find the percentage of kindergarten students covered by each vaccine. The average percentage of kindergarten students in Bexar County schools vaccinated against these diseases in the 2017-2018 school year is 95 percent, according to the data. 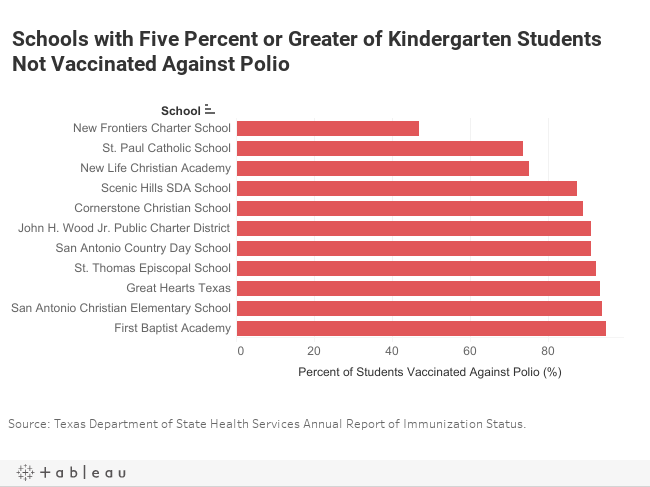 But some schools reported that less than half of their kindergarten students were vaccinated that year, such as New Frontiers Charter School on the near South Side, which reported 46.9 percent of kindergarten students vaccinated against Polio in 2017. The overall immunization rate of children between 19 and 35 months old in Bexar County (69.4 percent) was lower than that of Texas and the national average in 2016, but rose 8 percent from the previous year. Since 2003 the rate of non-medical exemptions including those based on religious or philosophical belief have increased in Texas by 2,352 percent, according to the Immunization Partnership, a Texas based nonprofit focused on immunization awareness and disease prevention, and 56,738 non-medical exemptions were claimed in Texas for the 2017-2018 school year. The Texas State Legislature expanded non-medical exemptions in 2003 to include personal beliefs, or conscientious objections that are not based on a religious affiliation. Allison Winnike, president and CEO of the Immunization Partnership, said the expansion of exemption categories makes claiming them easier. “Sometimes folks might feel that it’s easier to fill out the exemption form than to try to go get their kids vaccinated,” she said. According to Winnike, a dip in vaccination rates could increase the possibility of disease outbreaks, and that a safe threshold for vaccination rates is above 90 percent. “In some areas where these exemptions are clustering, they’re going to be falling below that protective level of community immunity. And we’ve seen outbreaks happen not only in Texas, but in other parts of the country,” she said. Increasing vaccine rates is a priority of the San Antonio Metropolitan Health District’s 2017-2019 Strategic Plan. In June, the organization expanded their immunization services, opening a vaccination clinic on San Antonio’s east side. This story has been updated to accurately reflect the availability of DSHS’s data on vaccine exemptions. Data Director Emily Royall is a technologist and urban planner focused on open data and digital equity. Bexar has gone from 0.32% in 2011-12 to 0.80% in 2017-2018.  While this may seem small, esp. compared to hotspots in the Dallas-Ft Worth and Austin areas, it is a troubling trend.